I have long had a desire to try welding. As much as I enjoy wood work, and the natural beauty of wood. There is an interest in the sheer lightweight strength of metal and the fairly fast fabrication associated with welding. After a long time of being a subscriber to the SVSeeker youtube channel (highly recommended) I found that I could resist the temptation no longer. So I went out and bought myself a Clarke 151EN. It seems to have a pretty good reviews, capable of some fairly serious work, with the potential to add a gas bottle later if I wanted to try that way. The next question was what to make? I am a terrible hoarder, and as such I had kept hold of the various metal framing components of an old bed. I discarded the mattress, but I kept basically everything else, since it had a solid cherry wood frame and a bunch of metal framing components and brackets. My stock of metal materials included about 4-5 meters worth of relatively small thin box section, a little under 4 m of about 4mm thick angle steel. and 4 corner brackets and 4 L brackets, all 4-5mm thick steel. I decided to make 2 things, firstly using the thin box section I decided to make a basic frame, essentially a table frame but without a top, that I would use to just provide slightly better storage for my longer lengths of wood. This was pretty easy to put together, I used a hacksaw to cut to lengths, and a grinder to clean up the areas that I was going to weld together. As my first project I found I very easily melted through the box section, and had to faff around a bit filling it in. I had mostly fairly poor looking welds, but even then, was producing good strong joins. I dialled the power settings down from what the manual recommended, and managed to do a little less burning through. What I ended up with was a very lightweight frame which has no problem with being piled up with wood. this gave me some reasonable storage options under one of my benches with hopefully easier access when I need to use any of it. This one came to me partly because after the first little project I wanted to try welding a thicker material. I looked at what I had and laid out my L shaped brackets. I realised I could tesselate them into a single large rectangular plate that would be about the right size for a stool seat. This would also be an interesting test of weld strength. Could I weld them such that the joins would be up to the task of taking my weight? It was fun welding the thicker material, no melting holes through, I felt like I was getting some pretty consistent welds. I wound up welding along both sides. possibly if I was any good I would only ahve needed to do so from one side? I'm not sure. in any case I did weld from both sides and felt like I got penetration throughout the join. Obviously in most situations grinding away a weld is kind of cheating. But in this case I wanted the top surface smooth so I felt no guilt at grinding everything nice and smooth. The magical thing about welding, as compared to gluing/nailing etc. Is that you literally melt additional metal into the join and create something that can look as if there was never two pieces. Yes a nicely done wood glue joint can look like a single continous piece of wood. But you aren't melting new wood into the join. With the welds ground down, you can see that there are some patchy holes, but in general it looks like a single sheet. Once I had the sheet done for the seat, I figured I could reuse the corner brackets to make the start of the legs, then use the angle steel to make the legs themselves. I had a smaller strip of metal which started out welded to the angle steel, which I used my grinder to remove. I was able to cut this into lengths and weld them as ties for the bottom of hte legs to hold everything together and square. Lastly I bought some castor wheels to weld to the bottom to make my stool mobile. And for good measure, I painted it red. It is a pretty heavy and sturdy stool, however in hindsight the wheels are really too close toegether in this design and on the uneven surface of my garage floor the stool wants to tip over more than it wants to roll. If I was doing it again I'd be tempted to consider some way of making a star shape to hold the wheels further out, to provide more stability. These were two fun and useful projects that I was able to make using only material that I had hoarded over the years. Havinng a welder means that I will now be keenly aware of salvaging scrap metal just as much as I am at holding onto any piece of wood that looks like it might one day turn into something nice. 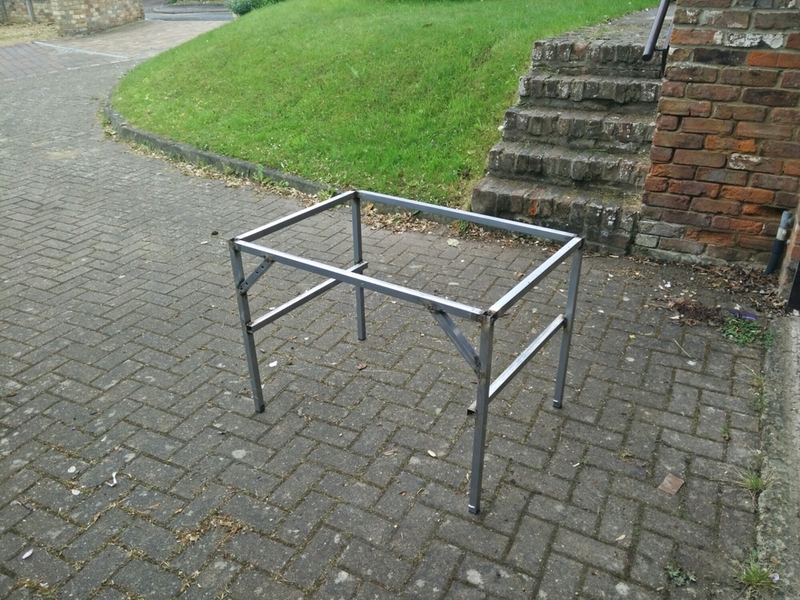 My next project is to make myself a proper welding table. Essentially a heavy duty metal workbench on wheels for the garage. This will require me to actually buy materials just for the project. I'll try to keep track of the costs so I can report the real world cost of making your own. Did you like this project? Hit like to let me know! Do you want to try a project like this and need to buy the supplies?